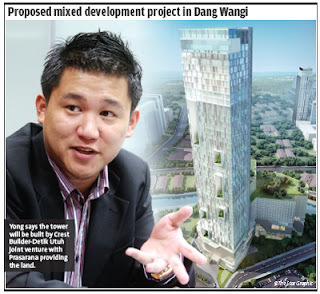 Yong says the tower will be built by Crest Builder-Detik Utuh joint venture with Prasarana providing the land. It will be a herculean task for low-profile Crest Builder, not least because the proposed building would tower over the neighbourhood at 40 storeys. Nonetheless, executive director Eric Yong is excited about its prospects. “The LRT below is really the key selling point. If this was just bare land, we probably couldn't have got this value and concept. “The main thing here is that you already have 8,000 to 10,000 people passing through the station everyday,” he told StarBiz in an interview. The yet-to-be-named project, which will be built on 2.72 acres, marks the Petaling Jaya-based developer's maiden foray into high-end properties since announcing the move last year. The plan, for now, is to build a tower cut into four segments: a mall at the bottom, small office flexible office (sofo) units, upscale serviced residences, and on the highest floors, a five-star hotel. To monetise the view at the top, the building could feature a Skylounge with a pool facing KL City Centre as well as a Skygym or Skydeck, Yong said. He pointed out that they were still deliberating whether to add a layer of office suites, in which case the hotel would be done away with. The tower would have 50 floors to accommodate eight to nine levels of duplex sofo units. Its planned total gross floor area measures 1.1 million sq ft while net floor area is close to 830,000 sq ft. Following the agreement with Prasarana, the LRT owner and operator will receive 21.2% of the project's GDV as payment for land rights, which translates into RM220mil, or about RM1,857 per sq ft. When contacted, its media affairs manager Azhar Ghazali said the funds would be used to part-finance its operations. Prasarana will only provide the land; the rest of the development cost is to be borne by Crest Builder-Detik Utuh. “It is expected that in the next six to nine months, the property sector will be under pressure from the tighter lending regulations but the market will evolve. Malaysian properties are still cheap compared with Singapore or Hong Kong,” Yong said. Physical works for the project is expected to begin in early 2013 and the launch could be sometime after the middle of that year. “Plus, we think completing it early may not be beneficial. We could fall into the lower part of the property cycle. Right now, the yield seems to be stabilising downwards. “We do not know how long this will last, but my guess is (the cycle) will take six to nine months to pick up again,” he added. Yong believes new record prices for property could emerge in 2017-2018. “The market takes three or so years to recover before it booms. We should see new benchmark prices then,” he enthused. Asked about Prasarana's intent for the project, he said the state agency had wanted to maximise the potential of its assets. “They have land in various locations but in this case (Dang Wangi), it was airspace. And because of the LRT, they also want to increase the number of pedestrians. “If I add this development, assuming that an extra 4,000 to 5,000 people live here and half of them take LRT, we would have added 2,500 people to the system,” he said. According to Yong, the tower's target customers would include the young and affluent in the banking, finance and marketing sectors. “Those who can afford premium condominiums but can't buy bungalows yet, and they want to be in the heart of the city with all its lifestyle attractions,” he explained. With the project being right next to the Klang River, Crest Builder is also readying a proposal for the project delivery partners of the River of Life (ROL). ROL, a project under the Economic Transformation Programme, involves the beautification and development of a 10.7km stretch of the river within the city centre. Its project delivery partners are Ekovest Bhd and Malaysian Resources Corp Bhd. “We have not officially approached them yet but we're looking at how ROL can enhance our development in this immediate stretch,” Yong said.